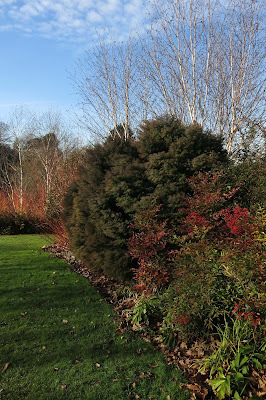 On a sunny day, the small - but perfectly formed, of course - winter beds in Golders Hill Park in north London bring a welcome glow and colour when the weather is cold and the days are short. 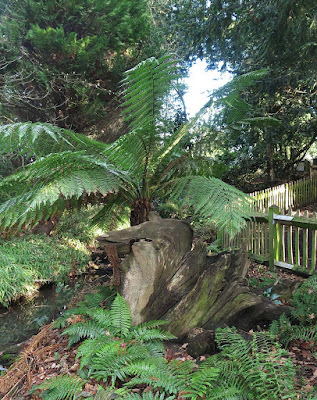 Most of us have gardens that look a bit grey, twiggy and bedraggled in winter. 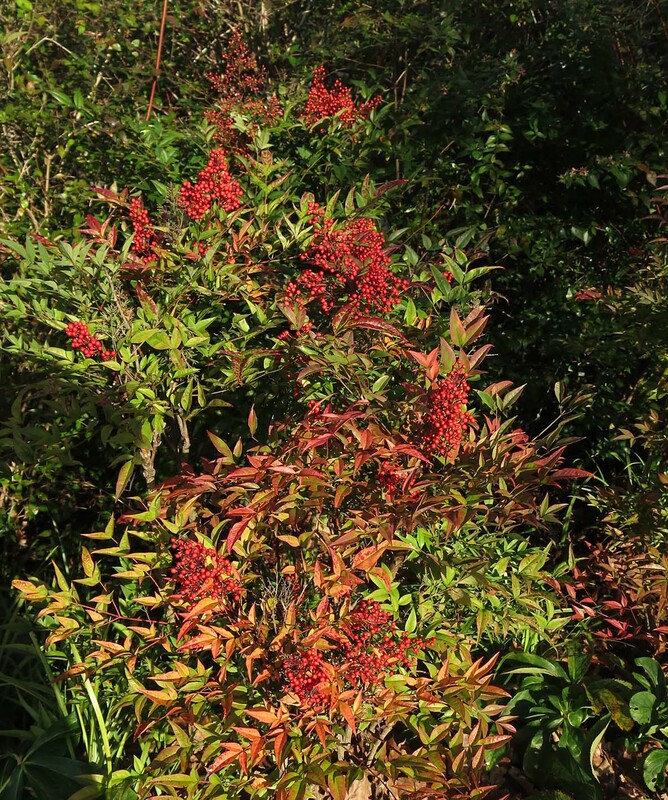 But winter gardens can be surprisingly colourful, making the most of berries, stems and bark to make a warm and striking display. 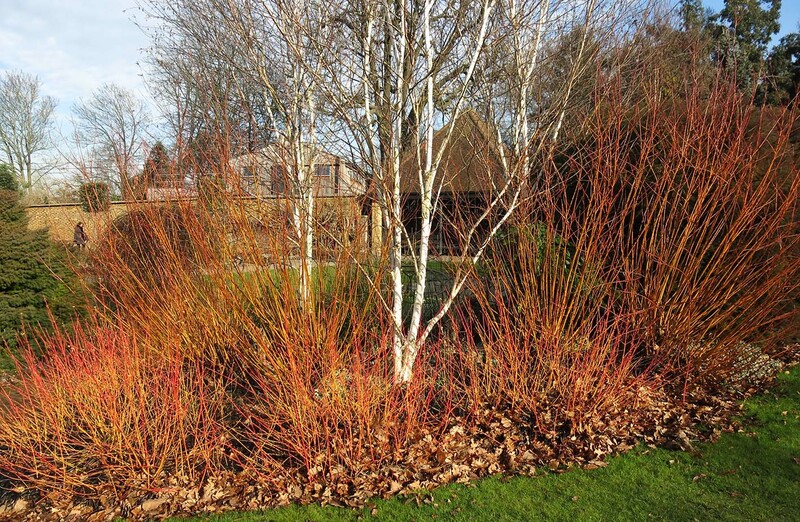 One of the UK's best known winter gardens is at Anglesey Abbey near Cambridge; The nearby Cambridge Botanical Garden has an impressive winter garden, as does Hillier Gardens in Hampshire. All of them have the bright stems of Cornus - the flowering dogwood - set against the white bark of Betula jacquemontii - as their centrepiece. After that, trimmed architectural evergreens can act either as a backdrop or to create striking silhouettes against a winter sky. 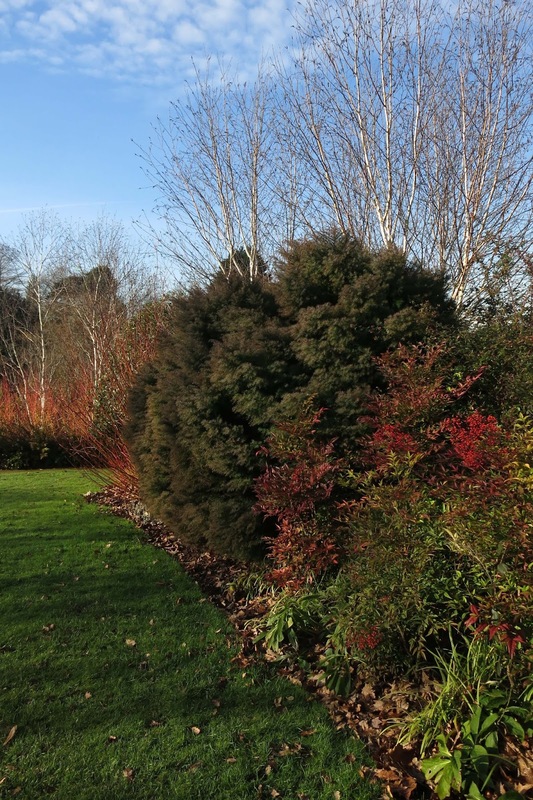 Ribes cockburnianus is another popular plant with its arching chalky silver stems, and the black blades of Ophiopogon planiscapus nigrescens offer contrast in edging many winter borders. Golders Hill Park in north London, managed by the Corporation of London, has a relatively tiny but still impressive winter display edging the more formal beds behind. 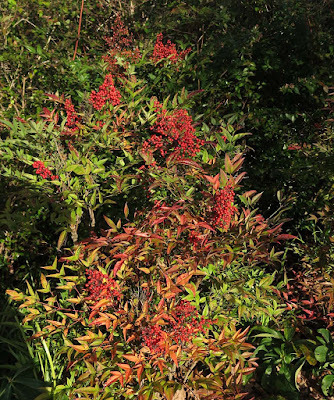 The classic Cornus sanguinea 'Midwinter Fire' contrasts with the Betula trunks, and this year the Nandina domestica shrubs have produced masses of red berries (below). 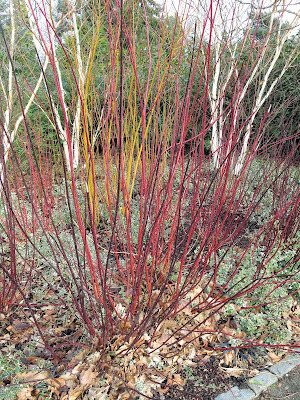 The purple stems of Cornus alba 'Kesselringii' are distinctive but to my mind it is 'Midwinter Fire' with its bright yellow stems tipped with red which looks particularly warming and attractive especially when planted as high density. 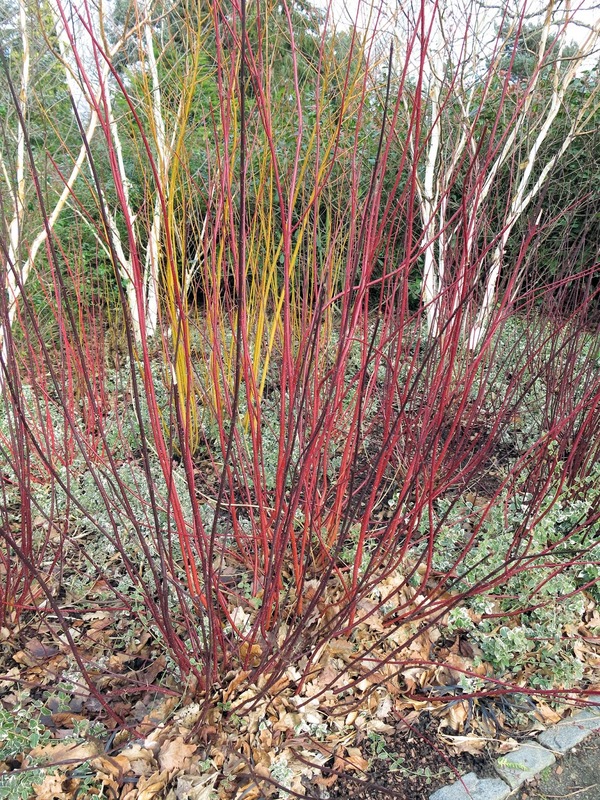 The purple stems of Cornus alba 'Kesselringii' add a darker, shadowy effect to the other Cornus cultivars and the white birch trunks behind. Golders Hill Park also boasts its own stumpery, a revival of a Victorian fashion, where tree stumps are arranged naturalistically to become a part of the landscape and provide a structure or backdrop for plants. 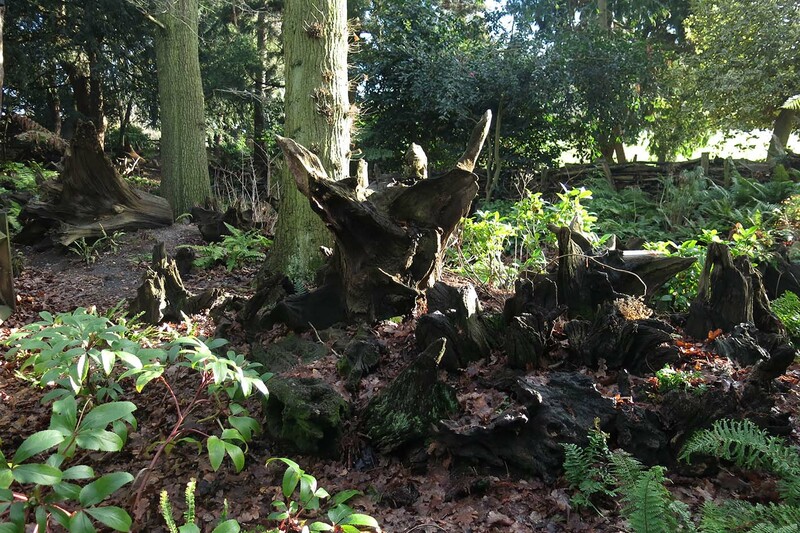 The stumps are not treated with any preservative and will decay very slowly over time to become a part of the woodland floor, as well as providing nesting and feeding sites for insects and birds and with hiding places for small mammals such as hedgehogs. I love the way the dappled light is caught on the tips of the wood and highlights the shape and the grain.